One of the most popular reasons to buy a hybrid like the 2017 Hyundai Sonata Hybrid is that it is economical. When the prices of gas go up, you start to lose money, so by putting a hybrid in your garage, you put a little extra aside for things you enjoy. The Sonata Hybrid is a slope-nosed, family sedan with a sport rear end that gives it a jaunty appearance that appeals to both conservative drivers and those who like a little excitement in their driving experience. The looks are enhanced by the clean lines from nose to rear that are only broken by recessed door handles. Sport wheels with pinwheel caps enhance the “go fast” look. The Sonata Hybrid is designed with LED daytime running lights and optional HID headlights that give you advanced visibility. These headlamps are placed at angles that resemble the bold stare of a raptor, and when coupled with that sloped nose, it’s easy to see the Sonata staring back at you from the driveway. LED taillights wrap around the smooth corners of the Sonata and make it easy for others to see when you brake or signal a turn. As you’re out enjoying the highways, the optional panoramic sunroof opens up to give you a glimpse of the heavens above. Where many sunroofs are confined to the front of the car or are so small that they are not that enjoyable, Hyundai opened their sunroof up to reach far into the back seat, so everyone can enjoy the stars. 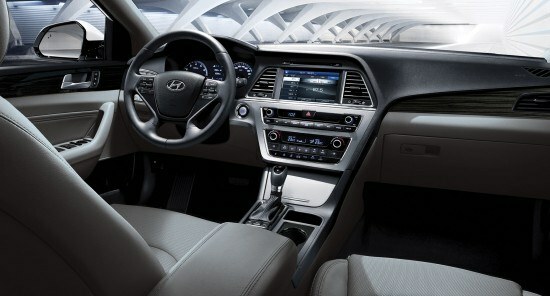 The interior of the Sonata Hybrid is built for driving comfort. The twin bucket front seats are comfy with their heated cushions against your body during a cold morning. Depending on your model, you may have heated rear seats and a heated steering wheel that keeps you from having to hold your hot cup of coffee all the way to work to stay warm. You can put it in one of the handy cup holders and wrap your cold fingers around the steering wheel instead. There is a lot of cargo room in the Sonata Hybrid. Because Hyundai uses an innovative design on their lithium-ion batteries, it is smaller and lighter weight. That means you get more cargo and passenger space. The battery is made from a polymer gel compound that allowed it to be a flexible package that the engineers could put under the cargo floor. Now, you store put more of your own things in the cargo area. When it is hot out, optional vented seats let you keep yourself cool by circulating air throughout the seat. The smart trunk knows when you’re holding the proximity key. It senses your presence and magically lifts the trunk lid for you. That’s very handy if you have your arms full of groceries or it’s freezing cold out. In addition to all of these features, the 2017 Hyundai Sonata Hybrid can be equipped with the latest in safety technology like blind spot detection and rear cross-traffic alert systems that give you a view of everything and everyone around you. The lane departure warning system, forward collision warning system and high beam assist all add extra layers of protection to you and your passengers. The technology is abundant inside as well. Android Auto keeps you connected. The Adaptive Cruise Control keeps your speed in check, and the rear camera lets you avoid obstacles. The 2017 Hyundai Sonata Hybrid is also very good for the environment, so come by and see us today. We will show you all of the other features of this green car.